The Maryland Bar Foundation honored Andre M. Davis, Baltimore City Solicitor and former U.S. Circuit Judge of the U.S. Court of Appeals for the Fourth Circuit, with its 2018 J. Joseph Curran, Jr. Public Service Award during the MBF’s annual spring Open Meeting and Curran Award Reception on May 3, 2018, at Cunningham’s in Towson. 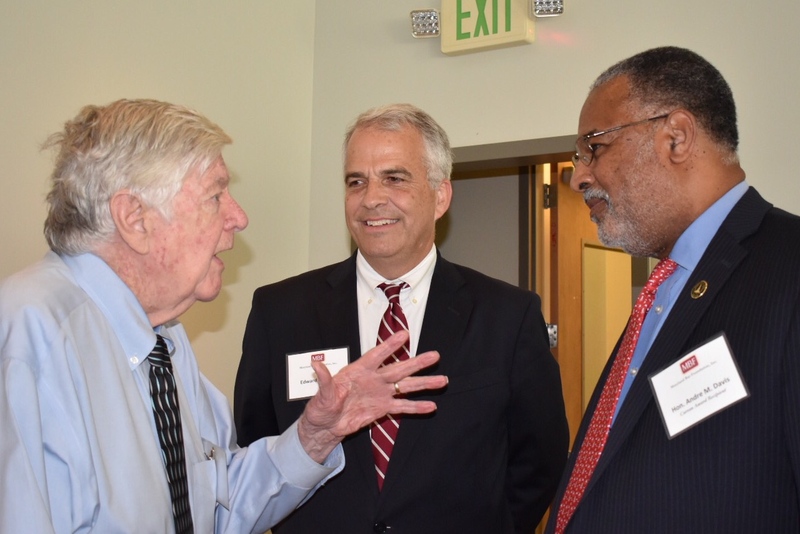 The nearly 50 attendees included the award’s namesake and inaugural recipient, former Maryland Attorney General J. Joseph Curran. Established in 2007, the Curran Award recognizes government or public interest attorneys known for their selfless service to the public good and furthering the goals of better government and societal standards. Previous Curran Award recipients have included current Deputy U.S. Attorney General Rod Rosenstein and Howard County Solicitor Margaret Ann Nolan. As part of MBF’s rebranding efforts, MBF marketing committee chair Elizabeth S. Morris also used the occasion to unveil a brand-new MBF logo intended to modernize the Foundation’s image and help to further its mission of maintaining “the honor and integrity of the profession of law, to improve and facilitate the administration of justice, to promote the study and research of law, and the diffusion of knowledge,” according to MBF President Natalie McSherry. For more information, visit the Maryland Bar Foundation online.